SDHI contributed to an event on the 23 October in the Steeple Church in Dundee that brought together many community organisations, Dundee city council and academics from various disciplines departments. The purpose of the four hour meeting was to explore how the university can engage and work more closely with local community organisations (e.g. Sign Post; Hot Chocolate). The event was led and organised by Dr Fernando Fernandes, School of Nursing & Midwifery/SDHI who – in his introductory remarks – highlighted the role of Brazilian scholar, educator and social activist, Paulo Freire in guiding the vision for more participatory and collaborative work between the university and the communities of Dundee. The afternoon was organised around round table discussion and a World Café style exploration of the issues that matter to communities. Many organisations struggle with limited resources and had mixed experiences with past engagement with the university. There was a strong wish for a real, not a tokenistic or temporary commitment for a joint working relationship. Value was seen in having the university build local capacity (accredited short courses), support practice-based evaluations, develop important technologies that reduce the monitoring and reporting burden, contribute to the volunteering programme. Academic expertise may also provide the evidence for promising interventions, which in turn may make funding more sustainable. The role of local businesses in potentially contributing to programmes that seek to address inequalities in pragmatic ways was also discussed. The event was just opening the discussion between the interdisciplinary ‘Engagement and Participation’ group at the University of Dundee and the community. 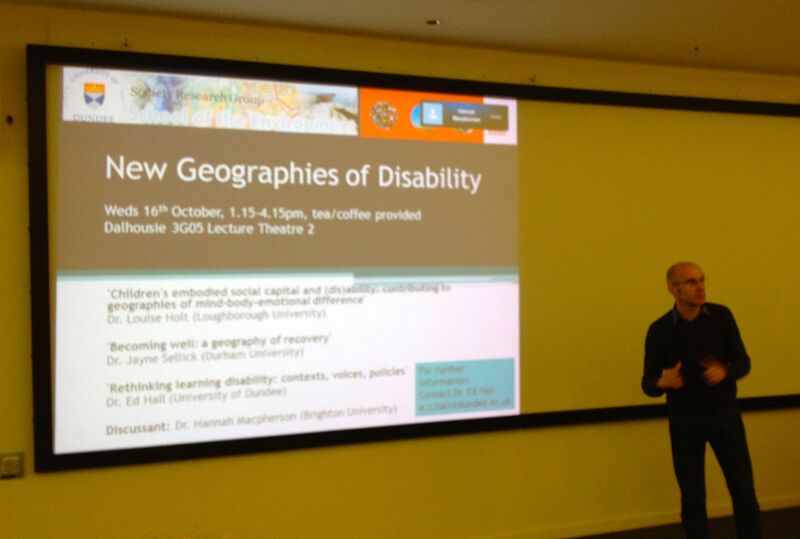 The mini conference, organised by Dr Ed Hall, examined from various perspectives the contributions that the discipline of geography makes to the socio-spatial understanding of disability. Dr. Louise Holt, Loughborough University, explored the complex interconnectedness of various levels and dimensions of social exclusion of children with socio-emotional differences (also labelled as Behavioural, Emotional and Social Difficulties BESD). She discussed how social capital ‘traverses’ various social spaces (home, school, leisure), the importance of social relationships and the challenges associated with compound social exclusion experiences. Jayne Sellick, Durham University, examined the notion of ‘becoming well‘ as opposed to ‘being well’. In her presentation, she questioned the linear notion of recovery and reflected – drawing on participatory research with a diverse group of people living with functionally limiting conditions – on the temporal, contextual and relational nature of recovery. Ed Hall reported on initial findings of a three-part workshop series , funded by the ESRC on ‘Rethinking learning disabilities: Context, voices, policies’. The workshops brought together people with learning disabilities, academics, health and social care practitioners, and policymakers. Three themes emerged from the discussions across the three events: (1) The meaning of learning disability; (2) Sameness and difference; and (3) Rights, justice and care. Learning disability is a real phenomenon that is relationally and contextually shaped. It is experienced in and by communities. Inclusion has to go beyond rhetoric and must become individually meaningful as well as contextually possible. In the workshops equal rights in the face of human diversity and not sameness were emphasised. A ‘de-socialised’ rights based approach has the potential to render people with learning disabilities vulnerable. The socio-relational support context is critical for people with learning disabilities to realise rights based inclusion. A social justice focus is particularly relevant in an era of economic austerity that places many support services for people with learning disability under threat.